A year ago this week, Sean Longstaff was preparing for a trip to Bury in League One after his loan club Blackpool’s deflating 2-0 defeat at AFC Wimbledon. On Tuesday night, he faced down David Silva and Kevin De Bruyne under the lights at St. James’ Park. Live on television, in front of 50,000 fans, he looked like he belonged. It was, the 21-year-old tells nufc.co.uk, ‘by far the best night of my life’. The zenith of his fledgling career coincided with his team’s most impressive result of the season so far. 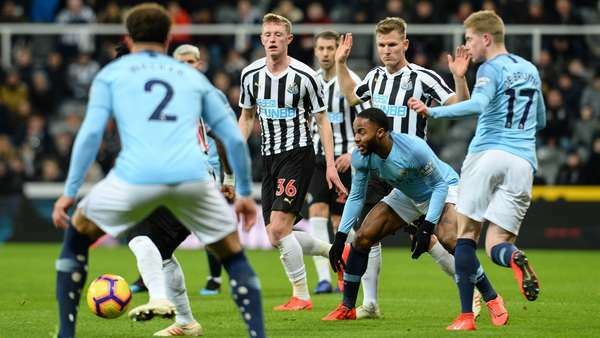 Behind after 25 seconds to Sergio Aguero’s swept finish, Rafa Benítez’s men rallied after the break, with Newcastle fan Longstaff at the heart of their recovery. “I just remember thinking ‘oh no’, and I think a lot of the lads were as well,” Longstaff says of City’s rapid start. “After that they still had chances – they’re one of the top teams in the world, so they’re always going to have chances. Salomón Rondón bounced an equaliser into the roof of the net with a third of the game remaining to stir St. James’ and raise hopes. Then, with ten minutes remaining, Longstaff robbed Fernandinho just inside the City box. “It all happened so fast. You know the type of team Manchester City are – they’re never going to just kick it up the pitch, so you can read what they’re going to do a bit, and luckily I’ve read what he was going to do and I’ve taken it off him,” he explains. “My eyes lit up for a second - I thought, ‘could I score?’ - but obviously I felt a bit of contact, went down and it was more important that we got the penalty to win the game than for me to have chance to score. Matt Ritchie dispatched from the spot – with “nerves of steel” – and United held on for a memorable, and vital, victory. It was just Longstaff’s third Premier League start, but he performed with a calmness befitting of someone with ten times his level of top flight experience. Along with Isaac Hayden, he helped shackle City’s celebrated playmakers, Silva and De Bruyne, after the visitors’ early surge. “To be able to play against them every week is only going to benefit me in the future, and I’ve loved every second of it. Playing against the top players in the world is a great way to see where you’re at as a player. Benítez takes his side to Wembley on Saturday, with a third straight league win in sight. It is difficult now, even after such a speedy rise to prominence, to imagine the North Shields-born midfielder – who Mo Diamé this week said reminded him of Frank Lampard – looking out of place. “It’s the home of English football and you see those lads in the Manchester City team playing there for England, so for me to have the opportunity to hopefully play there on Saturday is unbelievable. "Look, it’s an unbelievable night. I can’t really put it into words. I think towards the end I could hear the fans singing my name and I stopped, just looked around and took it all in."